Prime Minister Benjamin Netanyahu has refused to allow international observers to continue their mission in Hebron, where they have been present since a spike in Israeli-Palestinian tensions in the 1990s. "We will not allow an international force to act against us," Netanyahu said. Consisting of 64 members, the Temporary International Presence in Hebron (TIPH) has been observing the conditions under which the Palestinians live since 1994 when 29 Palestinians were killed in the Cave of the Patriarchs massacre. Its staff would report on incidents of conflict, but would not interfere. The West Bank city of Hebron has a Palestinian majority but is partially controlled by the Israeli military, who were placed there to protect the settlers in 1997. The actions of the Israeli troops conducting searches of the Palestinian population at checkpoints have often been criticized. 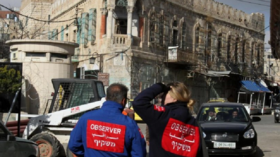 There has been a growing pressure from right-wing politicians and settlers to kick out the international observers from the area. Public Safety Minister Gilad Erdan accused TIPH of interfering with the work of IDF and creating frictions with settlers, according to the Jerusalem Post. The presence of TIPH that was staffed and financed by Italy, Norway, Sweden, Switzerland, and Turkey and is based on a bilateral agreement between Israel and the Palestinian Authority, renewed twice a year.